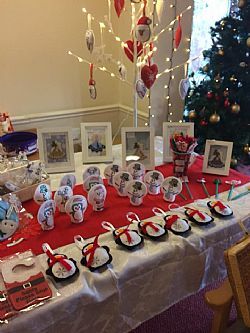 On Saturday 9th December, Herons Park Nursing Home in Kidderminster held a fantastic Christmas Fete for its elderly care home residents and their families. The rest home in Worcestershire was full of delicious home baked cakes, home made shortbread biscuits, mulled wine, mince pies and lots of other delicious treats. A big thank you to everyone that donated raffle prizes, items for the bottle stall or hand made crafts for the event, everyone had a fabulous time joining in with the Christmas festivities. The Christmas Fun continues at the nursing home throughout December, families are invited to join their loved ones at Herons Park for more Christmas fun with visits from the local school choir, holy communion, panto and the annual Christmas Party at the end of December.